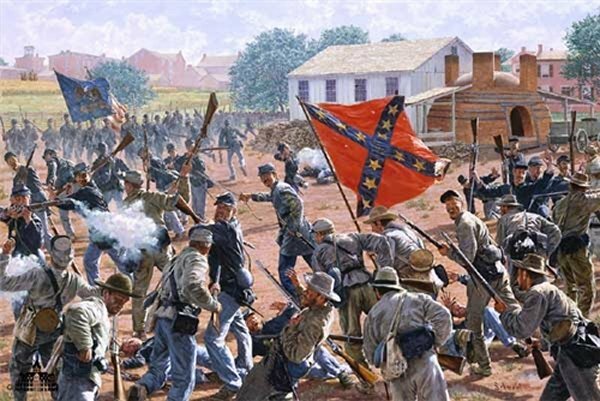 July 1st, 1863 – 6 pm-- We find ourselves in the brickyard of John Kuhn on Stratton Street near the Harrisburg Road. The Federal brigade of Colonel Charles Coster (1st Brigade, 2nd Division, XI Corps) is sent to the brickyard with orders to hold the line, so as to cover the retreat of the Union XI and I Corps, which are fleeing southward through the town. Inexplicably, Coster holds one of his regiments in reserve (the 7th Pennsylvania); he would certainly miss them on the battle line. Advancing southwest on a line parallel with the Harrisburg Road is General Jubal Early’s Confederate division. They have succeeded in driving elements of the Union XI Corps from the field. Now Coster’s brigade will bear the full brunt of the attack by the brigades of Hays and Hoke. Their already grim situation is made all the more untenable by virtue of the higher ground in their front which favors the attackers. It is not a question of whether the line will break, but when. Still in all, the Union men hold stubbornly until overwhelmed. The 21st North Carolina of Hoke’s Brigade, led by Colonel Isaac Avery, is shown charging the brickyard (note the dome-shaped kiln at right) as the 154th New York, sensing the collapse of both flanks of the brigade, attempts to retreat. Only a few got away; the majority of the regiment was captured. Now they face a war of survival in Confederate prisons.